Most Comfortable Three Wheel Bicycles For Seniors Outdoor Fun. From the lower step-through design, 3 wheels, extended support, to the improved handlebars, three wheel bicycles for seniors are specially built to help elders to continue enjoying cycling well into the golden years. 3 wheel bikes for seniors also make movement easier for elders with balance issues or disabilities in addition to being one of the few fun and senior friendly recreational and exercise tools. The elder will also be happy that he can travel with his cargo and do some shopping without bothering his/her caregivers among many other benefits. Now, I will be taking you to the interesting world of three wheel bikes for seniors and show you how you can use them to improve the quality of life for you and/or your loved ones. What Are 3 Wheel Bikes For Seniors? 3 wheel bicycles for seniors are bikes with a triangle construction or simply three wheels. This design is intended to enhance their stability and make them safer for the aged population. Today, three wheeled bikes are considered one of the best mobility aiding accessories. As we said earlier on, three wheel bikes for adults are more stable and by far safer than 2-wheeled bikes and seniors will always keep their balance. This means that incidents such as falls – which can potentially cause serious injuries-will reduce drastically. Ergonomic handlebars, cozy backrest, soft grips, and better pedaling design all help keep issues such as back pain and discomfort away. On a related note, most of the leading adult tricycles are not as heavy as conventional bicycles so they’re much easier to ride. This motivates him/her to exercise by cycling, an action which can go a long way in strengthening his bones. There are many other health boosts associated with working out for seniors such as better sleep, weight loss, improved joints, better heart rate, and more. Bikes for seniors are a cool rewinding activity at the end of a tiring day. Going out there, enjoying the scenery, and the evening breeze will bring a fresh, exciting feeling and can help beat stress. Cycling also triggers the release of the happiness bringing endorphins helping to reduce anxieties and depression. Cycling also brings him/her out of the home where he can meet old friends and overcome the loneliness associated with old age. He/she will also have a chance to join a senior’s oriented cycling club and create new friendships. 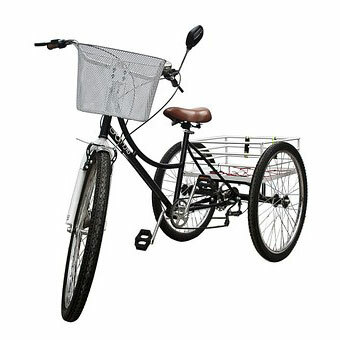 The Best tricycle for adults has wider rear wheel base giving them the ability to carry significant cargo. A senior can thus go shopping for groceries and other personal items independently. Are There Some Disadvantages Of Using A Tricycle For Adults? A 3 wheel bike wider standing can make it tougher to handle when turning because of the bigger turning radius. The problem is more pronounced at slower speeds. Recumbent trikes and such extremely low lying models may not be visible to other drivers in traffic and can expose the elder to potential accidents. To mitigate this, riders using such recumbent can attach a flag perched atop a tall fiberglass rod. The best 3 wheel bikes for adults are broader than conventional bicycles and can stick out in traffic particularly when cycling in narrow lanes or sidewalks. This can be both inconvenient and dangerous during the rush hour. Additionally, such a broader makes them harder to store with the exception of a folding 3 wheel bike which easily folds for storage. Now, trikes were not invented yesterday. ..their history goes back to the 1800s and so the market has seen many players come and go over the preceding years. A few brands have however managed to stand tall by consistently releasing innovative three wheels. Schwinn has been in this business from way back in 1895 and has produced some of the most iconic models to ever grace the market. Another superstar, Komodo Cycling designs some of the easiest to assemble units. They put simplicity and performance first and have also been excelling in making tricycles with very advanced gear systems. The history of three wheel bicycles is never complete without Raleigh Bikes. The company goes for perfection and if you look at their products, they are not doing badly. One of their best selling models is the classy Raleigh’ s 3-speed tristar trike. Another giant, Mobo has so many bikes and caters for the needs of the entire biking community, not just senior cyclists. In the senior category, their recumbent trikes are rated up there with the best. Ridgeyard also impresses with its knack to manufacture highly customizable tricycles. 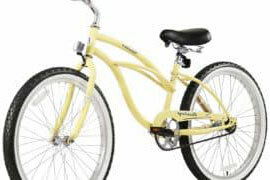 They are also one of the most favored brands by seniors who prefer bicycles with collapsing baskets. What Are Different Types Of Three Wheel Bikes For Adults? There are so many types and sub-types that you can easily feel overwhelmed. Electric tricycles for adults are hybrids and have both pedals and electric motors. You can hence pedal and exercise whenever you feel like or sit back and have it do the donkey work. This three wheel bicycle could be the way to go for seniors who need a bit of help when climbing as their gears help conquer challenging uphill without much struggle. The EW-29 Electric best captures this design. Recumbent tricycles are simply magnificent and a dream for many an elder. They are very low to the ground and have an amazing stretched-out frame that allows the rider to recline with his/her legs relaxing in front. They also come in diverse styles and have foremost aerodynamics, are very easy on your back, and are so comfortable. The common larger front wheel eases steering while the two rear wheels improve stability. For long rides, recumbent trikes like the exalted Mobo shift 3-wheel bicycle offer improved speed control and posture. The only complain is their expensive pricing. A semi-recumbent fuses the best of full recumbent and traditional trikes. It uses a lower resistance “pedal forward” design and is a bit raised from the ground. It’s thus best suited for seniors who may find recumbent tricycles too low and standard models difficult to pedal. A semi-recumbent trike delivers one of the comfiest rides. These can be folded for storage and can hence fit in very tight spaces. The collapsible design makes them fantastic for the frequently traveling senior as they’re easy to pack into a car trunk. Moreover, this category of tricycles takes up less room space at home making it great for a senior citizens living in a small apartment or shared spaces. These are traditionally upright-positioned 3-wheelers that come with a rear cargo basket and a couple of gear options (mostly not exceeding three speeds). They are the bike of choice if your elderly friend mainly rides around the vicinity running errands or bikes for pleasure or just fitness. Popular upright models like Schwinn meridian adult trike are also economically-priced and ideal even for those on a low budget. A tandem tricycle comes with 2 seats (front and at the back) meaning the elder can ride in the company of the spouse or caregiver. They also provide pedals for the second person so the senior can call on his company to help pedal when he wants to catch some breath. Also called sociable, buddy trikes, or side-by-side tricycles, these bikes support two riders, and unlike, in tandems where one sit on the fore and the other after, the elder and his/her co-rider here sit close ,side by side. Though they were for many years used as courting bikes, they help the rider to bring his favorite buddy along and can uplift the experience and further kill loneliness. Some three wheel Bicycles for adults have multiple gears to make easier to go up hills and go faster on level lanes. Gears are like speeds. For example, a 3 gears tricycle will have 3 speeds with the first gear being a low gear. Still, like in other bikes, you can go a gear higher (upshifting) or down (downshifting). The difference with two-wheeled bicycles is in that these gears are easier to shift plus that trikes have reassuring super-responsive brakes. As I had indicated earlier, Komodo makes a variety of models including gear types. A good example from them is the komodo cycling 6-speed tricycle. One of the best 3 wheel bicycle for a disabled person or seniors with serious mobility problems is a recumbent model because it’s easier to use and balance. A recumbent trike also puts less pressure on the back than the upright tricycle bike adults. The elaborate design recumbent tricycles makes it excellent for longer rides. How you or your loved is planning to use the rike one has a huge say in the type of the senior citizen tricycle that would best serve him/her. A top quality 3 wheel bicycle would, for example, be more appropriate if the user is going to be riding it daily. Conversely, an ordinary three wheel bike will be just fine if the senior citizen is an occasional rider. Three wheel bikes can offer unlimited options when we come to accessories. You will get mirrors, security locks, GPS technology to help you locate him/her, safety flags, headlights, and more. One should select the model that has all the features that add the greatest value. Users with conditions such as arthritis or weaker muscles will find joy in loop handlebars than traditional handlebars or chopper handlebars. This is because loop handlebars are easier and work even with people having a poor range of motion and weak hands. Upright 3 wheeled bikes come with the popular saddle-style seats which aid in comfort and avoid numbness. The biggest news in the sling-style nylon seats that come with recumbent trikes is the enhanced back support. An adjusting and movable bike saddle is even better. As you check other factors, don’t forget that lightweight tricycle for adults are easier to ride so the frame design should be lighter but sturdy, whether folding or otherwise. At the same time, a plus-size senior may also need 3-wheel bicycles that can support their extra pounds so the weight rating question comes up. Also, consider the fitted basket and whether you prefer a folding basket and if it will serve as needed. As part of ensuring he/she is safe on busy roads, a trike requires a good braking system. Higher-end trikes use the strongest hydraulic or disc braking but are costlier. For typical adult tricycles, the braking is normally rim-activated, like on two-wheeled bikes. All in all, what matters is that he/she can stop it as soon as a danger arises. For seniors in love with geared three wheel bikes, the most suitable gear ratio largely depends on his/her preferred riding style, ability, and experience. That being said, elders who live in areas with steep inclines will require bikes with appropriate gearing to enhance performance. Consulting a friend or someone who has owned a geared three wheel bike in the same region can help you get clues on the best type of gearing. Three wheel bicycles for seniors keep the wheels of riding pleasure turning, helping our elderly population to enjoy all the health, lifestyle, and exercise benefits of cycling. Additionally, the best three wheel bicycles for seniors help the aged to overcome balance issues as well as various mobility handicaps. In the end, he/she will enjoy a better lifestyle and reclaim the all-important independence.